Yes, The U.S. Is On A Historic Lucky Streak In Dodging Major Hurricanes : The Two-Way A major hurricane hasn't hit the U.S. since 2005. There hasn't been a lull that long since 1861 to 1868 — when Abraham Lincoln was president. 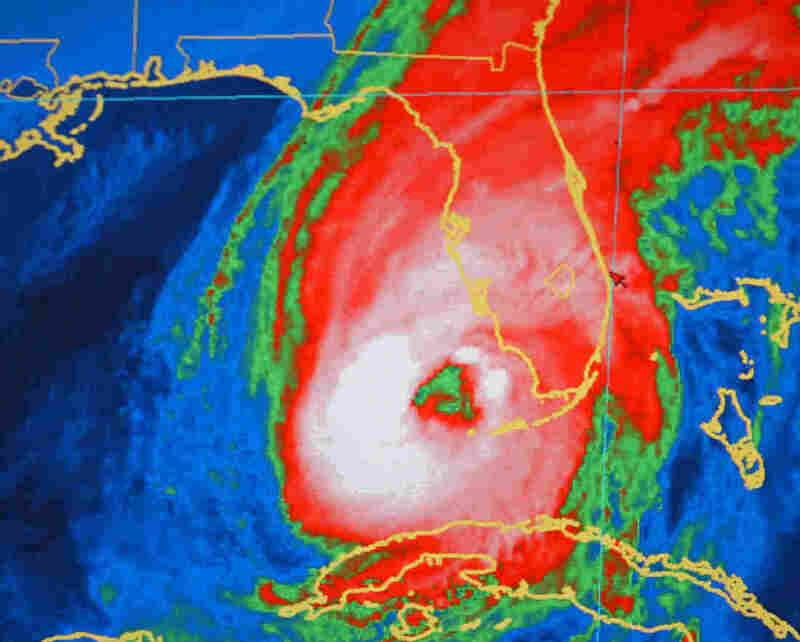 In this National Oceanic and Atmospheric Administration color-enhanced satellite image, the center of Hurricane Wilma is shown about 70 miles southwest of Naples, Fla., on Oct. 24, 2005. Friday afternoon, Danny became the first major hurricane of the 2015 Atlantic season, after it was upgraded to a Category 3 storm. It's still very far out in the Atlantic, and so far there's no sign it'll pose a threat to the United States. 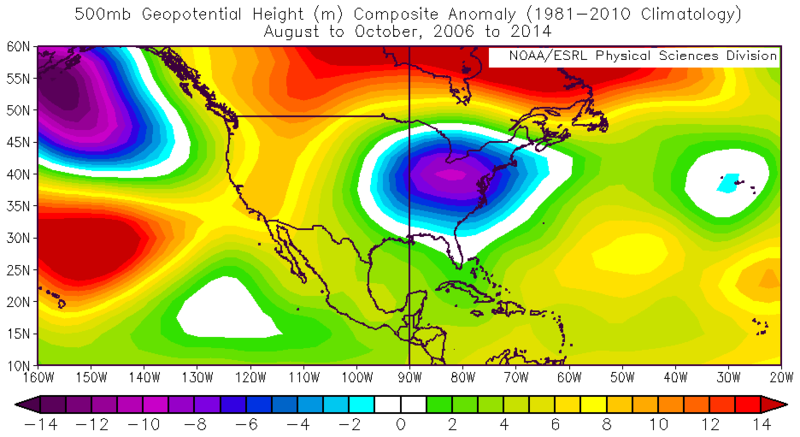 That leads to a question: When was the last time a big hurricane hit the U.S.? It might surprise you, but the country is experiencing a historic, nine-year lucky streak when it comes to major hurricanes. Phil Klotzbach, a research scientist who helps put out closely watched hurricane predictions at Colorado State University, said the last time you could spot a lull of this kind in recorded history was 1861 to 1868. "That was the Abraham Lincoln and the Andrew Johnson administration, so certainly it's been a very long time since we've seen anything similar to what we currently have," Klotzbach said. Earlier this hurricane season, scientists Timothy Hall and Kelly Hereid published an article in the Geophysical Research Letters journal about this phenomenon. It's hard to tell how frequently a lull this long happens, because records only date back 164 years. But extrapolating from that data, the scientists estimate that this respite happens once every 177 years on average. Klotzbach said it's definitely not because of a lack of intense hurricanes. "During those nine years, we've had 25 major hurricanes form in the Atlantic basin and none of them have made U.S. landfall," Klotzbach said. "Now the average is about 1 in every 3 major hurricanes that forms in the Atlantic Basin makes landfall, so to go 25 with none is extraordinarily lucky. If you look at the odds of that, that's something like 1 in 5,000." Of course, this drought seems even more stark because 2005 was the most active hurricane season on record. The U.S. alone saw five hurricanes make landfall. Four of them — Dennis, Katrina, Rita and Wilma — were Category 3 storms. In their research, Hall and Hereid found that over the past nine years, Cuba, which is just a few degrees latitude south of Florida, has been hit by five major hurricanes. That's "well above its long-term rate," they wrote. Florida, on the other hand, has not been hit by a single hurricane — even a Category 1 or 2 — during that time. The state's longest streak previously had been five years, from the 1980 season to the 1984 season. Brian McNoldy, a researcher at the University of Miami Rosenstiel School of Marine & Atmospheric Science, wondered whether there had been a climate shift that would explain why the U.S. was being shielded from the strongest hurricanes. He looked at something called the "geopotential height," which is a field that is generally responsible for steering tropical systems, not unlike how wind moves a sailboat. In the peak summer months, there's usually no special steering pattern acting as a shield for the U.S. Some storms enter the Gulf of Mexico, some hit land, and others curve back out to sea before reaching land. McNoldy averaged the mid-atmosphere geopotential height over all of the summers for the past nine years and found evidence of a weak "trough" — or an elongated region of low pressure — over the Eastern U.S.
"There's a hint that there has been enhanced troughy-ness over the Eastern U.S. So large scale, long term, it does seem like there is a little something there that may be able to steer some storms away from the States," McNoldy said. But, he warns, this is a tiny deviation — a less than 1 percent change — in a long-term average. It means that on any given day or week, that measurement could have been different, able to steer a storm toward the East Coast. McNoldy, Klotzbach, Hereid and Hall all agreed on one thing: The most important thing driving this drought is chance. Or, some would say, luck. There's also no way to know when this luck will run out. As McNoldy puts it: "Hurricanes have no idea what happened last week or last year. You could get four major hurricanes in one year and then none for the next 15 years or one a year for a while. They have no concept of how long its been since the last one."